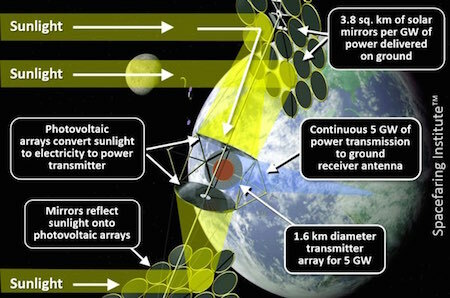 As long as President-elect Trump is thinking about NASA and energy, he might think about space solar power systems. America’s space enterprise was not a topic of discussion during the Trump presidential campaign beyond vague mentions of general support when campaigning in Florida. While NASA’s supporters can be expected to push for returning NASA astronauts to the Moon or going to Mars, the better alternative is to focus on informing the incoming Trump Administration how America’s commercial human space enterprise can be used as an economic tool to strengthen and secure America. The public has concluded that no policy or action to secure America’s post-fossil fuel energy security is now warranted. They have no idea of what it will take to replace fossil fuels or how soon this will be needed. President-elect Trump is now setting the policy and legislative agenda for his administration to fulfill his campaign promises. Three very important topics that will likely receive attention are national energy independence, global atmospheric environmental protection, and the Paris Climate Agreement. An invigorated American commercial human spacefaring enterprise, focused on space-based sustainable energy, provides the means to strengthen America’s future energy security, address the political hot potato of atmospheric carbon dioxide buildup, and provide the basis for renegotiating the Paris Climate Agreement—and to do all of this with likely strong bipartisan support. As a consequence, the White House National Space Council, under the direction of the vice president, could be reinstated to establish clear interdepartmental and congressional coordination of these efforts. Science fiction authors had been popularizing the idea for at least a couple of generations. Only forty million miles from the sun's surface, its sunward side is raised nearly to red heat by the blazing radiation. And the shadow side, naturally, is down to the utter cold of space. There is a temperature drop of nearly seven hundred degrees between the two sides, and Williamson cells turn that heat-difference into electric current, with an efficiency of 99 percent. Then the big Dugald tubes - they are twenty feet long on the Power Planet - transform it into the beam which is focused on the Earth and delivers something over a billion horsepower to the various receivers that have been erected. Fans of Golden Age sf also recall with fondness the Near-Space Solar Energy Collectors from Olaf Stapledon's 1937 novel Star Maker and the Solar Energy Beam from Clifford Simak's 1941 story Masquerade.